Welcome to Mrs. Gore’s VERY FIRST cooking tutorial. Good. I knew I liked you. 1.) When it comes to cooking and baking, I’m not original AT all. I don’t hardly even tweak recipes. I follow them, I follow them well, and if I like them, they go in my file. 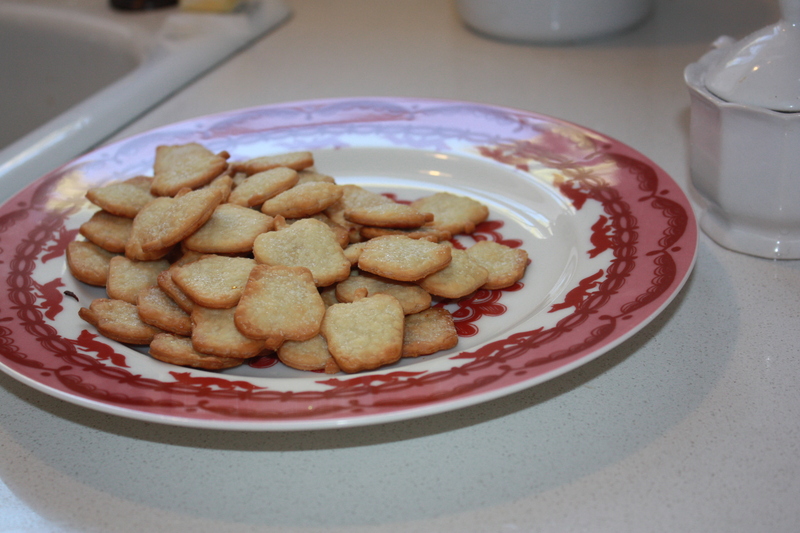 So I will be inventing and sharing a recipe with you probably…never. (It is for this reason that Mr. Gore and I refer to my kitchen alter-ego as Mrs. Blandings – its much nicer than calling me BORING). 2.) I’m still a learner in the kitchen, not even close to an expert, but I am capable and have great potential. At least that’s what Mrs. Blandings tells me. 3.) I like shortcuts, especially at this stage in my life. 4.) I love parties and special moments, and food naturally falls into this category for me. 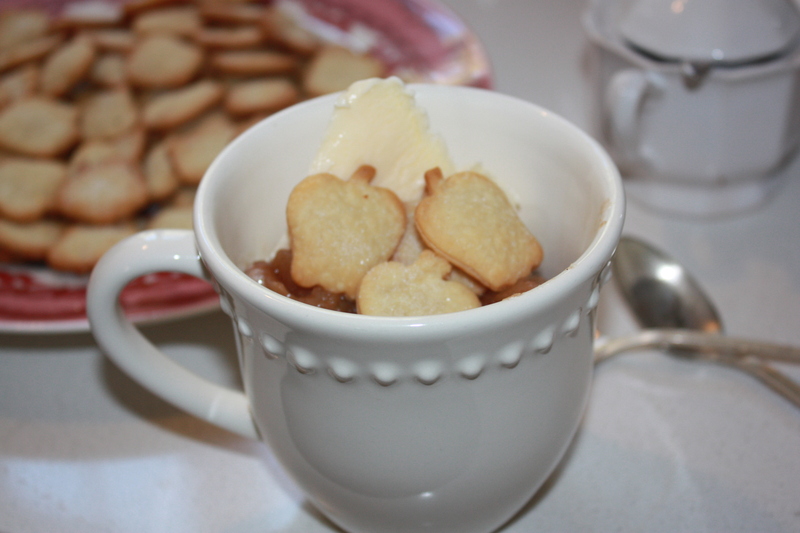 That’s what I like to do most in the kitchen ~ add whimsy and love and beauty to the things I make, whether it is for a party or for afternoon coffee with my Mom. But enough about me…let’s talk about dessert! 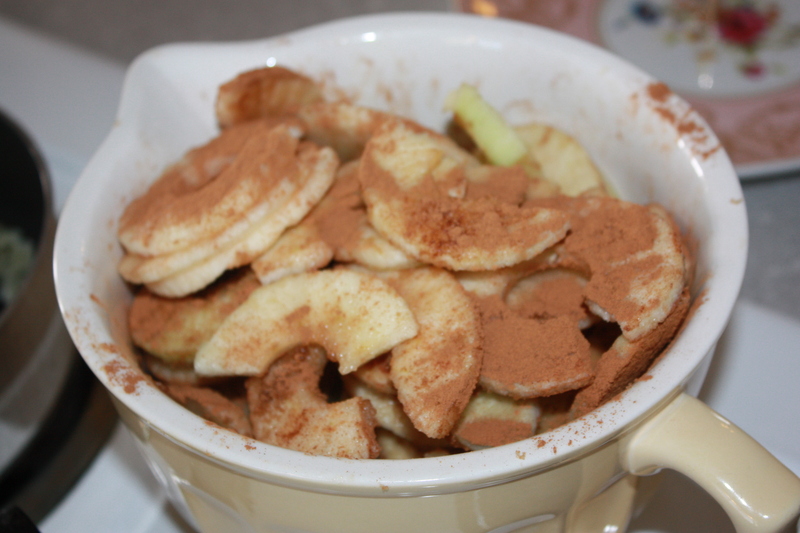 I’ve been making spiced apples since Mr. Gore and I first married. 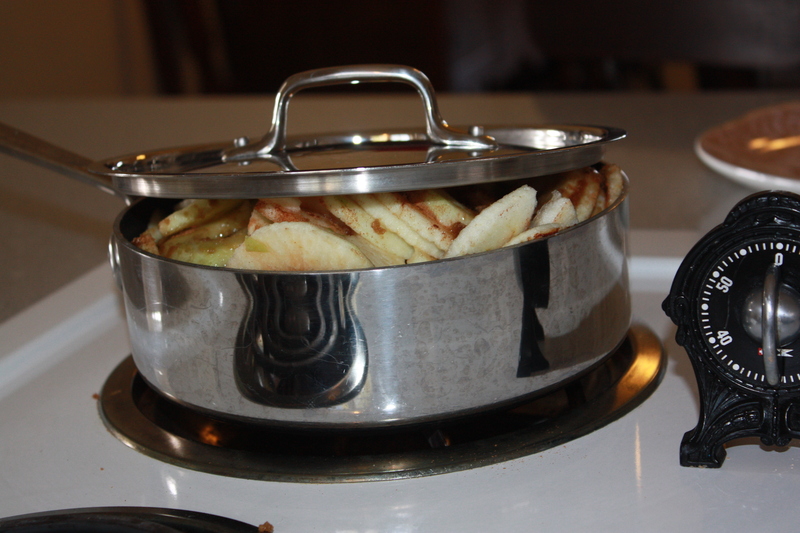 On my wedding weekend, my fabulous Aunt Susan let me in on a little secret: “If you haven’t gotten much accomplished in a day and your husband is about to be home, throw some sliced apples in a pot and cook them with cinnamon and sugar and butter. Your entire house will smell amazing and he’ll think you’ve been working all day.” (I told you she is fabulous). I heeded her advice within the month (with a recipe from this Gooseberry Patch cookbook ) and she was right…what an easy and foolproof way to bring warmth and comfort into your home. And its tasty, too! (Thank you, Aunt Susan). Eventually, I started eating these apples with ice cream. And just the other day as I was enjoying such a treat, I decided that the only thing missing from my dessert was some pie crust. With that simple addition, I would basically be eating apple pie! 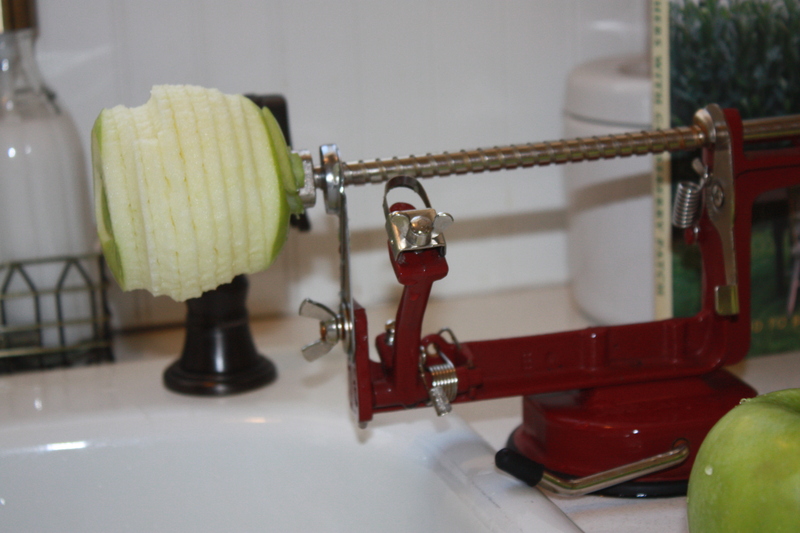 I shared a link to this little contraption on Facebook last week – it does the peeling, coring and slicing for you and is so fun to use. My gym teacher had one in elementary school and I thought it was magical – and I still do today! 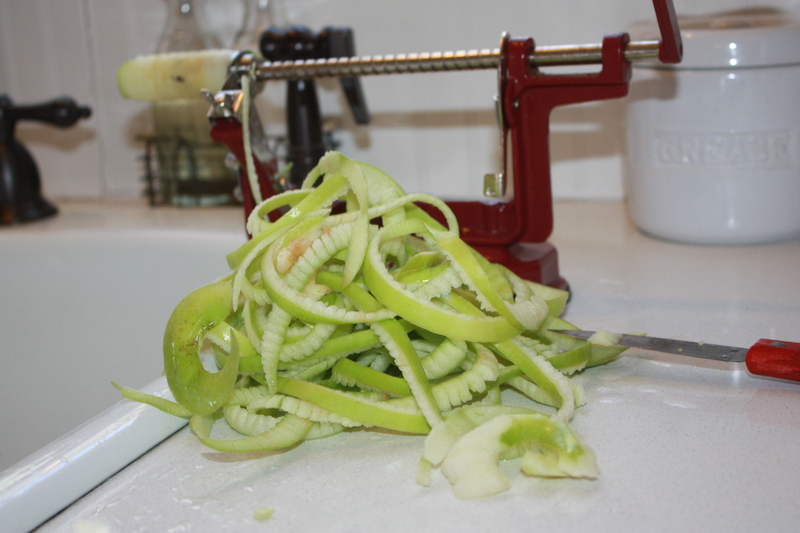 When you are finished, you’ll have a huge pile of apple peel “snakes” for your little boy to eat or play with or throw at his little sister. Outside, of course. 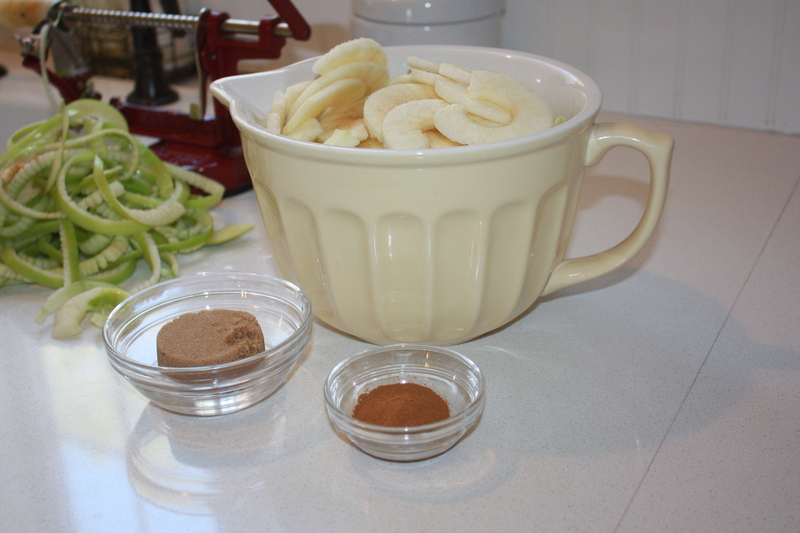 Place your apple slices in a large bowl and measure out 1/4 c. brown sugar and 2 tsp. cinnamon. Toss, toss, toss! But before you do, set 1/4 c. butter to melting in a pot on the stovetop. I took a picture of the melting butter, but it looked weird. 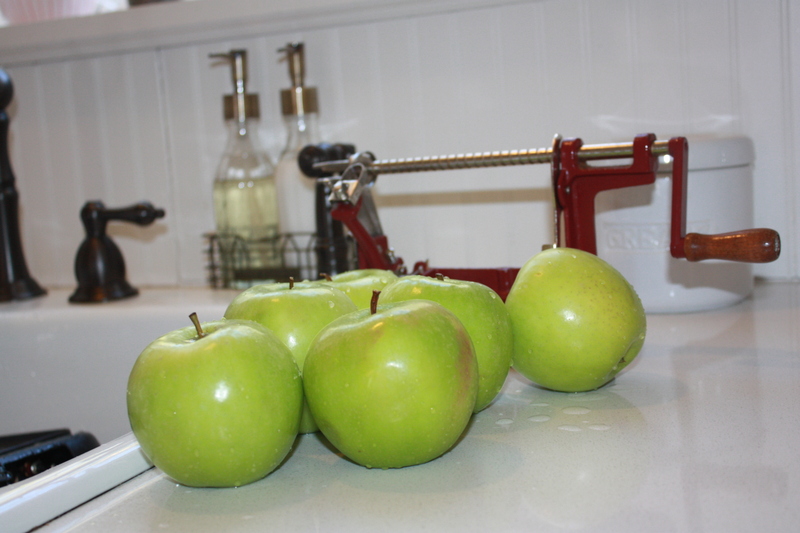 So here’s a picture of the apple slices after the tossing. 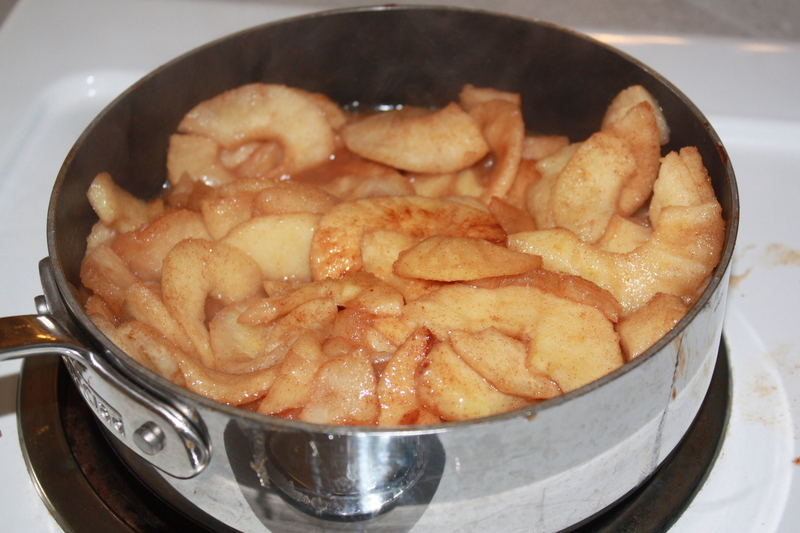 Place the apple slices in the pot with the melted butter and cook for 15-20 minutes over medium heat. 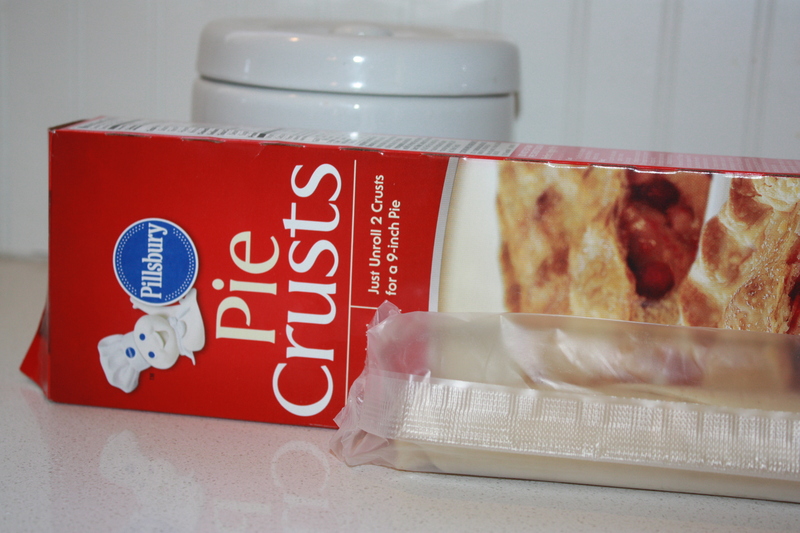 I’m sure you know this, but these Pillsbury pie crusts are wonderful to use in a pinch or when you’re being lazy. 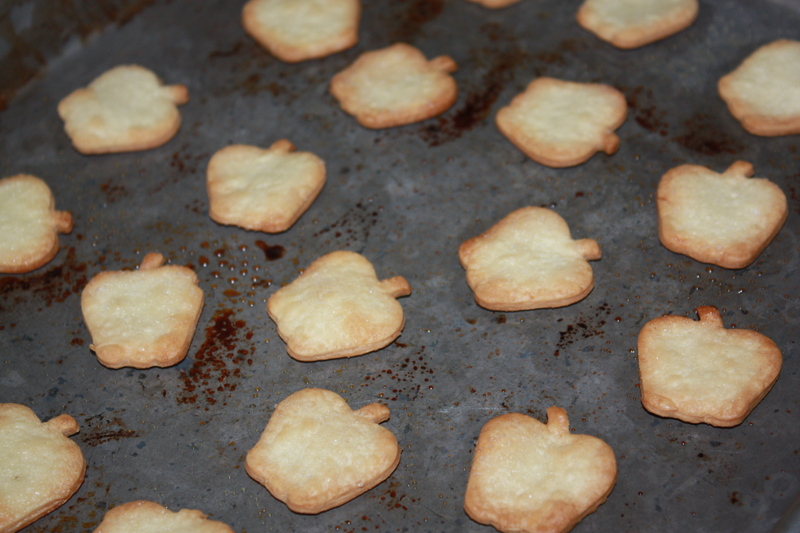 I wouldn’t use them for a REAL apple pie (or would I? 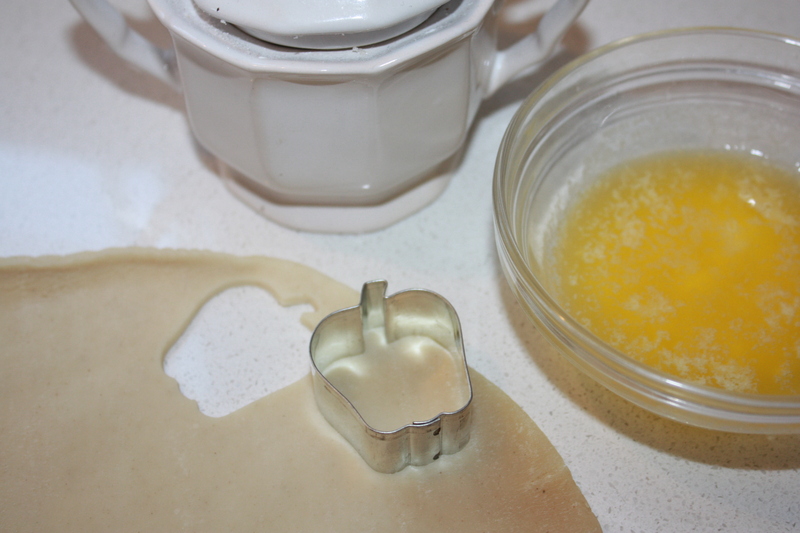 ), but since this dessert is titled “Easier Than Apple Pie” we can’t be rolling out our own pie crusts, now can we? The answer is no. No, we can’t. Unroll the dough (that has been out of the refrigerator for about 15 minutes) onto your countertop – no flour needed – and begin cutting out small shapes. 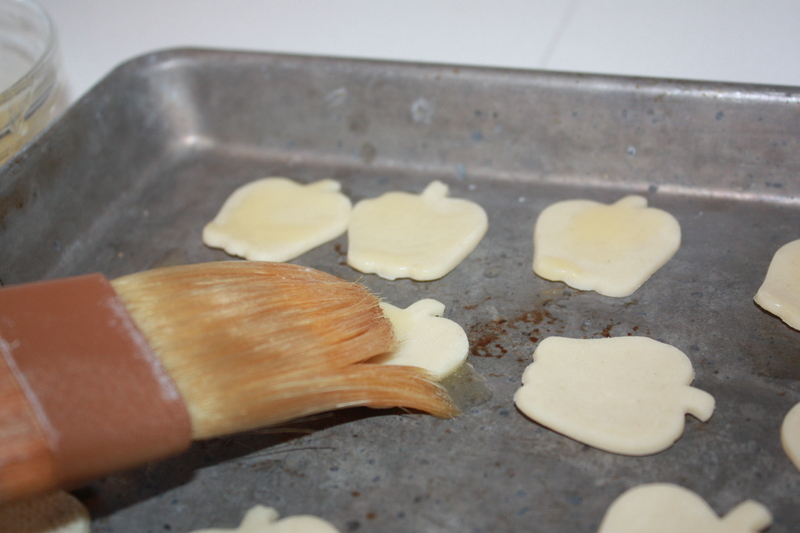 Place them on a cookie sheet. 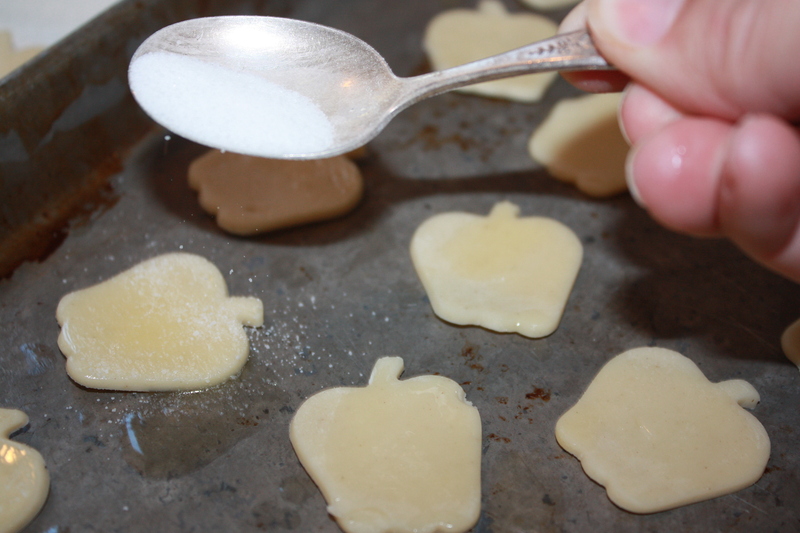 and pop them into a 425* oven for 4-5 minutes, or until lightly browned. 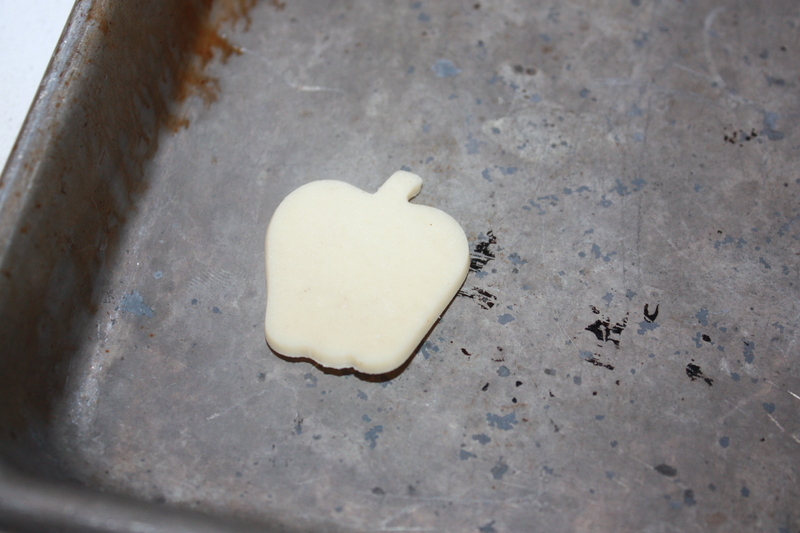 Meanwhile your apples should be smelling delicious. Don’t forget to stir frequently! and transfer them to a pretty plate or bowl. 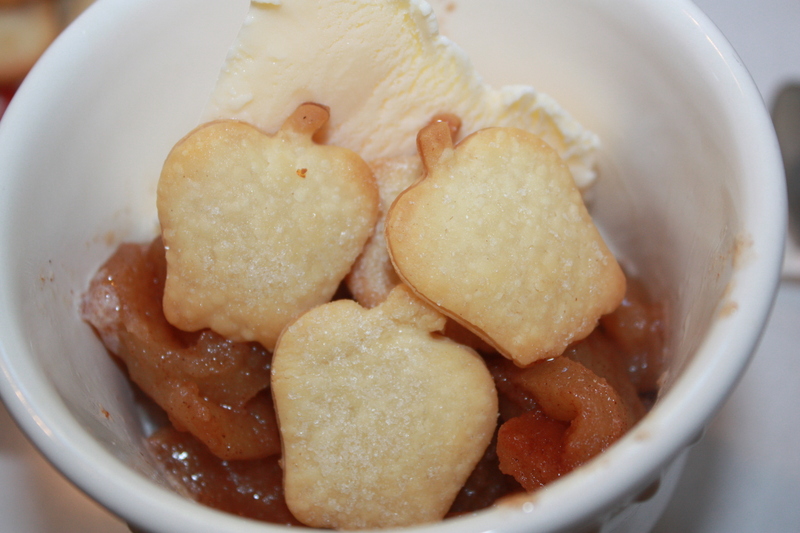 Scoop some ice cream into a bowl or mug, top with piping hot spiced apples, and drop of few pie crusts on top. Then grab a handful to sprinkle on as you eat…trust me, you’ll want more than three. The finished product tastes pretty close to apple pie a la mode, but it takes half the time and effort. And its kinda cute, don’t you think? Just like Mrs. Blandings. (geeze, that lady is so vain). And the good news is, if you make too many crusts to use up with your apples and ice cream, they taste pretty good all by themselves. I’m still snacking on mine. I mean…Mrs. Blandings is. She is such an oinker. This “recipe” will definitely be a staple in our house, whether we are having friends over or just need something good to eat on a Friday night. Welp…that’s all I’ve got. Happy cooking, you lazy thing.